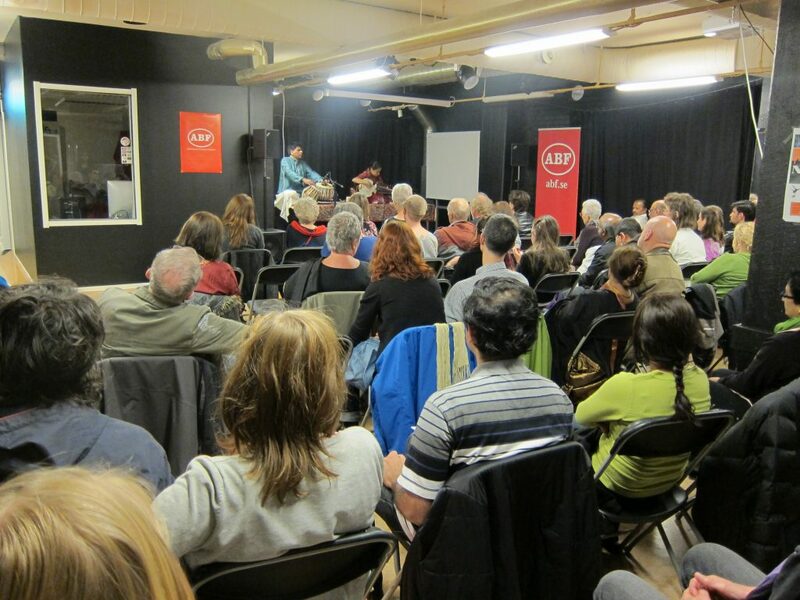 On Wednesday 16 May 2012, an evening programme devoted to Indian society and culture was held in Lund. 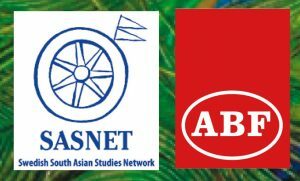 The successful event was jointly organised by SASNET/Lund University and Arbetarnas Bildningsförbund (ABF) Lund, and was free of charge. It drew a full house. Venue: ABF premises, Bangatan 10 (opposite the railway station), Lund. See the poster. The programme started at 6 P.M. with a lecture by Professor G K Karanth on ”Caste ‘Pride’ and Caste ‘Prejudice’: Personal Reflections”. Prof. Karanth comes from the Centre for Study of Social Change and Development at the Institute for Social and Economic Change (ISEC) in Bangalore, India, but during the academic year 2011/12 he has been the ICCR India Chair Professor at Lund University hosted by SASNET and the Department of Sociology. 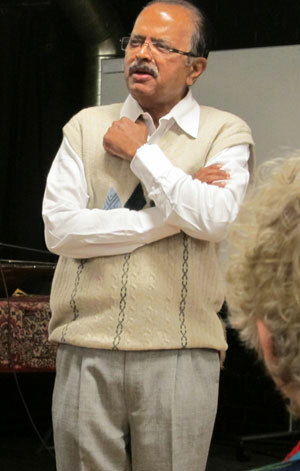 In his presentation, he discussed issues related to Indian caste identities, based on his own personal experiences as having been born and brought up in a family with a caste identity of its own. Having spent over thirty years as a student of Indian society, culture and social change, Professor Karanth has had to respond to a question repeated on many occasions and by many colleagues and friends. The query pertained to his own identity as a member of a caste. His response has been by recalling a statement attributed to one of the characters created by the well known Indian litterateur, Professor U R Ananthamurthy in his novel ‘Samskãra’: “Even if I leave my caste behind, (my) caste does not leave me (alone)!” This statement may well capture the lived reality of nearly all Indians and in all parts of the subcontinent. More so in contemporary times than, perhaps a decade ago. 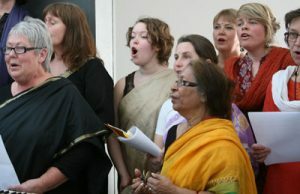 The lecture was followed by an appreciated performance by the new India Choir of Lund (Indiska Kören i Lund), led by Bubu Munshi Eklund and Thomas Wiehe. The choir performed three songs by Nobel Laureate Rabindranath Tagore, sng in Bengali, and a number of devotional bhajans sung in Sanskrit. Photo to the right.Finally at 7.30 P.M. came the cultural highlight of the evening – a classical North Indian music concert by young talented Sarod player Somabanti Basu from Kolkata, being accompanied by her husband Suman Sarkar on Tabla. Somabanti Basu was trained by Ustad Ashis Khan and Srimati Anima Perera, and plays according to the Maihar gharana tradition. 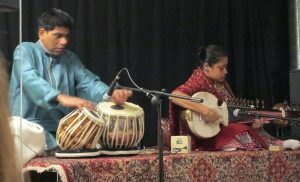 Basu and Sarkar have toured Europe frequently since 1992, and had just started their 2012 European tour. 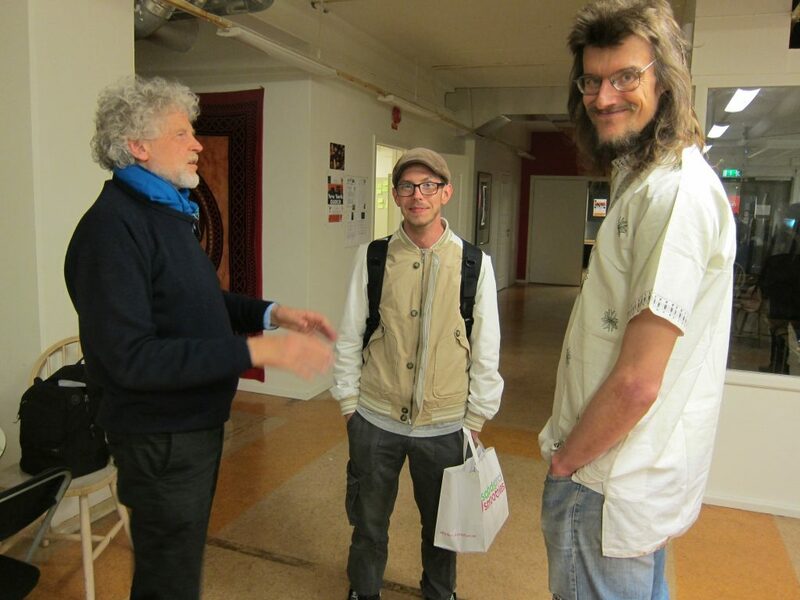 On the day before, 15 May 2012, they performed in Copenhagen. The Lund concert was their only performance in Sweden. The audience was totally enthralled by the superb play by the eminent Bengali artists. The India Evening ended by serving of Indian snacks, delicious samosas all prepared by Bubu Munshi Eklund.